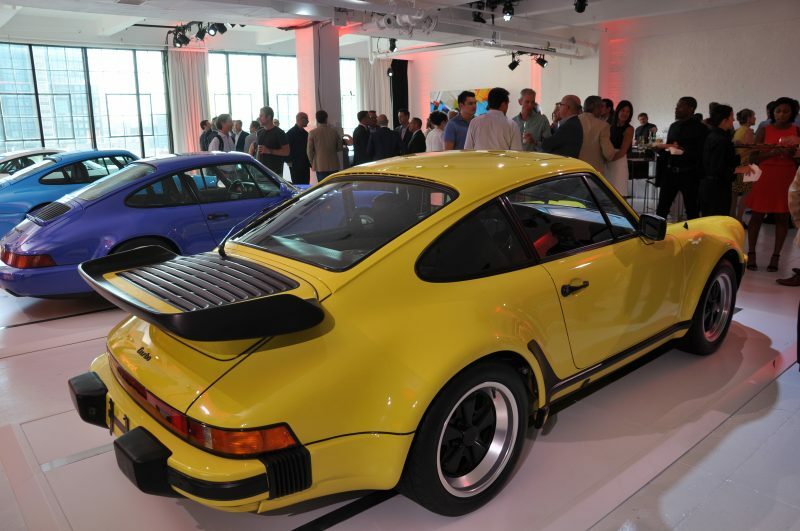 The Porsche 911 is a true design icon and an exclusive celebration for it took place on August 8, 2017 at the New York Museum of Contemporary Art. This invitation-only event was open to local Porsche dealers, journalists, Porsche collectors and to the Porsche Club of America which included the local Board of the Metro NY Region and the Executive Officers from the National office. Meticulous 911’s from each generation were on display in a beautiful loft setting. 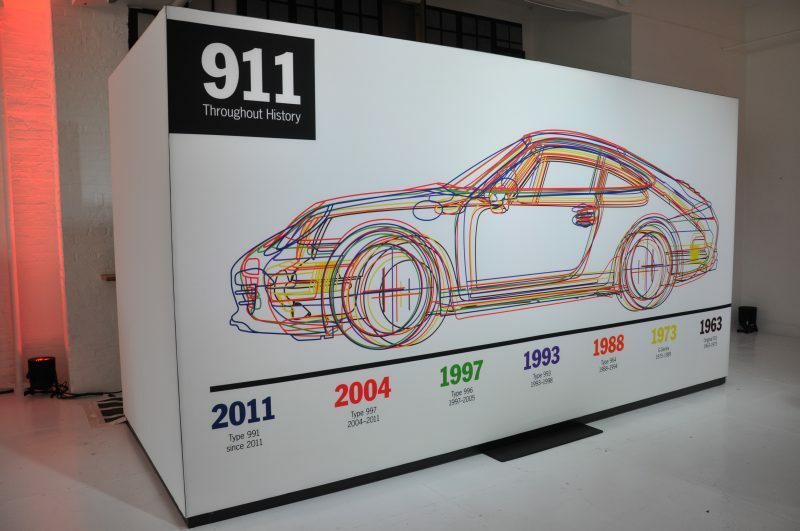 911 Models through the generations, comparing proportions. What we didn’t know yet was that the very first 911 and 1,000,000 911 built were to be shown on the same podium somewhere in the building. Drinks and hors d'oeuvres were passed for the first hour while guests admired the special 911’s that were presented in front of coordinating artwork backgrounds. The Porsche’s were place in chronological order with descriptive placards describing their heritage. Two of the 911’s were loaned from Jerry Seinfeld's Porsche collection. Jerry currently owns the first air-cooled 911 from 1964 and the last air-cooled 993 made in 1998. 1992 Porsche 911 Carrera RS (European) owned by the Ingram Collection. 1998 Porsche 911 Carrera 4S; The Last Air-Cooled 911 owned by Jerry Seinfeld and is from the 993 model line (1993 – 1998). Night-time view of the last 993 built. 2004 Porsche 911 GT3 RS (European) owned by the Ingram Collection. 2006 Porsche 911 Carrera S PCA 50th Club Coupe from the 997 model line (2004 -2012). The glow of the 911’s rear end is what makes this car so special. At 7:00 PM, we were asked to descend to the lower level, to a room that was curtained off. Low and behold the first and the millionth 911 built were together sharing the same stage. Roughly 53-years of time and 1,000,000 production units later separated these two historic 911’s. Christian Koenig, VP of Public Relations for PCNA, jumped on stage and welcomed us to the celebration. A montage of slides was shown to account for the life-to-date production cycle of the 911. 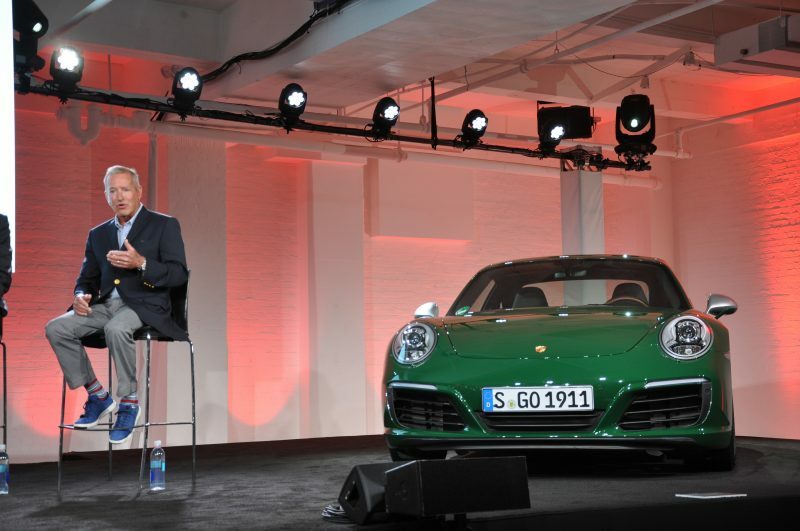 After the visual show was over, Tony Hatter, Director of Design Quality, Style Porsche, came on stage to discuss the 911’s beginnings and went through its 53-year model life cycle. Tony was the primary stylist for the 993 and led the design of the 911 GT1 race car. Back in the 1990’s, clay modeling was still being used by a team of up to 10 designers. Today, the 991.2 has over 190 employees working on the current design with the use of sophisticated CAD software. After Tony presented, he introduced the rest of the evening’s panel who joined him on stage. The panel spoke to the design of the 911, how visceral it felt when driving, how the cockpit felt at home no matter what model year you were in and how the 911 is still true to its original design roots. From left to right: Tony Hatter, Michael Prichinello, Co-Founder of Manhattan Classic Car Club, Jay Fielden , Moderator and Editor-in- Chief of Esquire, Rama Chorpash , Associate Professor and Director of Product Design at Parson School of Design and Hurley Haywood, American Race Car Driver and Porsche Brand Ambassador. 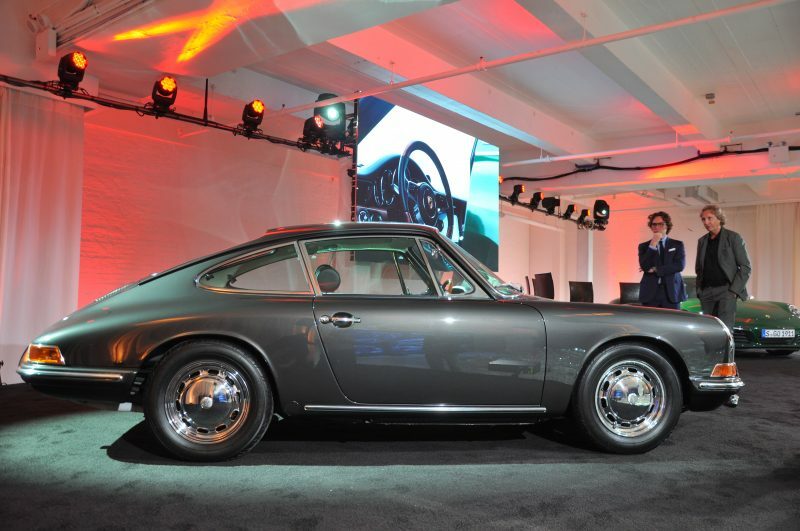 Hurley Hayward added that the 911 got bigger over time because of safety features, tire size, engine design and going from an air-cooled to a water-cooled plumbing configuration. The first 1964 911 from the F- Series (1964 – 1973) was built specifically for Ferry Porsche and it rolled off the assembly line in October 1964 and is now part of Jerry Seinfeld’s personal collection. Finally, the one-millionth Porsche 911 from the 991 Series ( 2011 – Present), that was built on May 11, 2017, was honored. This Porsche pays homage to the first 911 with its Irish Green exterior color, hounds tooth seats, wood interior trim and manual gearbox. This Porsche will not be sold (sorry, Jerry), and is currently on a world-tour before going on display at the Porsche Museum in Stuttgart. The night ended knowing that this opportunity was once in a lifetime. However, a few months ago I was able to snag the 1/44 Spark model set commemorating the millionth 911 made. It may be sold-out by now but everything is for sale for the right price, right? Great review Chuck and thank you for inviting me to join you.